The definitive survey, combining current scholarship with a vibrant narrative. Carefully informed by feedback from dozens of scholars, it remains the book that students and teachers trust to explain what’s important, where it fits, and why it matters. Peter Burkholder weaves a compelling story of people, their choices, and the western musical tradition that emerged. From chant to hip-hop, he connects past to present to create a context for tomorrow’s musicians. What’s important, where it fits, why it matters, and who cares. 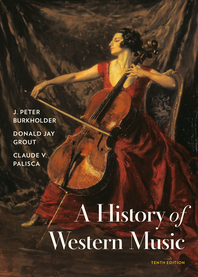 The book and anthology traverse more than 1000 years of history, music, and musicians. The focus throughout is on understanding the connections between music and its context--whether musical, cultural, or historical. Students learn to apply this knowledge to music they hear, play, or study today. The Anthology offers 229 compelling works supported by the pedagogy students need. This companion anthology in three volumes provides the scores for every major work discussed in the text. The new edition offers 36 new or expanded selections, from new medieval chant examples to 21st-century works by Caroline Shaw and Thomas Adès. Recordings of each work are available for streaming and download. Expert reviewers pored over every chapter to provide detailed recommendations for the revision. Peter Burkholder carefully sifted through these reviews, adapting and integrating suggestions to fit within his clear narrative – always mindful that he is addressing undergraduate readers. Every chapter in the book reflects this process in ways both great and small. New media resources that sharpen analytical skills and motivate engagement. Help students learn more than mere names and dates. Dynamic new tools and content motivate the application of concepts and develop musicological skills. Every new copy of the book provides Total Access, including all activities, study tools, streamed audio from the entire Norton Recorded Anthology of Western Music, and opera excerpts from our exclusive Metropolitan Opera video.